Curated Cocktails: Psychosexual Zombies – Happy Hour at the Museum! Join us for Happy Hour at the Museum! Warm bodies and cold drinks… it’s a no brainer! MCASB is offering $5 signature cocktails created by Outpost at the Goodland‘s resident mixologist, Chris Burmeister. FREE tours of the current exhibition, Teen Paranormal Romance, art activities, treats from Whole Foods, and a special set by DJ Darla Bea. Presented in conjunction with Downtown Santa Barbara’s 1st Thursdays. 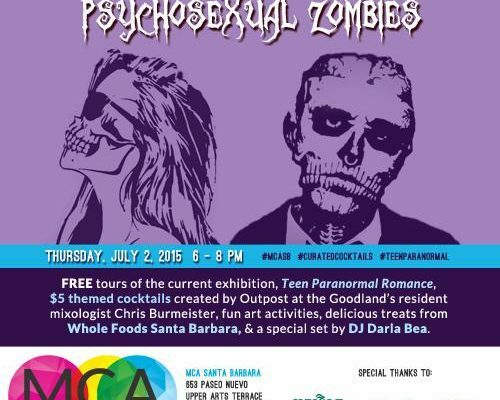 Register for Event: Curated Cocktails: Psychosexual Zombies – Happy Hour at the Museum! Your ticket for the: Curated Cocktails: Psychosexual Zombies – Happy Hour at the Museum!